Web Poll Sofware. Preview your poll design while you work on it. Lots of customizable features like: background colors and images, borders, fonts, size, button, cursor images, and more. Show or hide colorful bar graph and number of votes. View voting results instantly online. Prevent duplicate votes. Put online voting polls in webpages, IFrames, or popups. No CGI, No MySQL database, Unlimited use. No additional costs. ...... 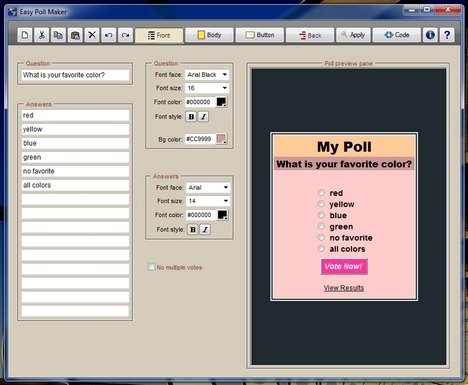 Put polls in webpages, IFrames, or popups. No online control panel. No 3rd Party Host. No CGI, No MySQL database. Make an unlimited number of online voting polls on an unlimited number of websites. No additional fees or costs. Qweas is providing links to Easy Poll Maker 4.1 as a courtesy, and makes no representations regarding Easy Poll Maker or any other applications or any information related thereto. Any questions, complaints or claims regarding this application Easy Poll Maker 4.1 must be directed to the appropriate software vendor. You may click the publisher link of Easy Poll Maker on the top of this page to get more details about the vendor.